We’d love your help. Let us know what’s wrong with this preview of Dog on It by Spencer Quinn. 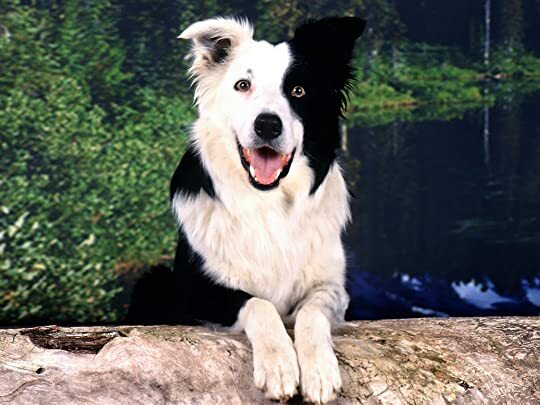 In this, their Meet Chet, the wise and lovable canine narrator of Dog on It, who works alongside Bernie, a down-on-his-luck private investigator. Chet might have flunked out of police school ("I'd been the best leaper in K-9 class, which had led to all the trouble in a way I couldn't remember exactly, although blood was involved"), but he's a detective through and through. In this, their first adventure, Chet and Bernie investigate the disappearance of Madison, a teenage girl who may or may not have been kidnapped, but who has definitely gotten mixed up with some very unsavory characters. A well-behaved, gifted student, she didn't arrive home after school and her divorced mother is frantic. Bernie is quick to take the case-something about a cash flow problem that Chet's not all that clear about-and he's relieved, if vaguely suspicious, when Madison turns up unharmed with a story that doesn't add up. But when she disappears for a second time in a week, Bernie and Chet aren't taking any chances; they launch a full-blown investigation. Without a ransom demand, they're not convinced it's a kidnapping, but they are sure of one thing: something smells funny. To ask other readers questions about Dog on It, please sign up. is this good for kids??? Bill Wellivere It does contain profanity albeit not much. Probably (sadly) no more that kids hear every day. QNPoohBear Not in the hardcover library edition. If you ever wanted to stick your head inside a dog’s brain, wiggle it around a little, and see what decides to pop out, then DOG ON IT is the book for you. If you’re a mystery lover with a heightened sense of curiosity about said dog, then that’s even better. If you don’t love dogs on some sort of basic level, then you might find yourself in a state of uncertainty. Or maybe you like unique voices in detective fiction. But the bottom line is it’s all about the dog, and Chet fills every page with If you ever wanted to stick your head inside a dog’s brain, wiggle it around a little, and see what decides to pop out, then DOG ON IT is the book for you. If you’re a mystery lover with a heightened sense of curiosity about said dog, then that’s even better. If you don’t love dogs on some sort of basic level, then you might find yourself in a state of uncertainty. Or maybe you like unique voices in detective fiction. But the bottom line is it’s all about the dog, and Chet fills every page with his unique perspective. This book was an easy read, but it was a darn fine enjoyable one, too. Chet was lovable, affectionate, filled with happiness and joy, and just so darn cute. He changed direction about as often as Britney Spears changes her underwear, but I got caught up in whatever scent, or thread, or squirrel happened to pop into view. As for unique voices, though, I’m drawn to those like cars are to potholes. Chet made me feel like I was driving down I-25 with my head stuck out the window and the wind assaulting me, as my nostrils filled with the fresh air after a brief desert rain. The rhythm of the sentences, the quick turn of direction, and the bubbles that seemed to pop with the utmost ease allowed me to believe I was inside Chet’s head every step of the way. Sure, Chet had his faults, but he was as lovable on the first page as he was on the last. And sure the mystery could have been more complicated, but this is a dog’s perspective after all. It helps to look at it from a slightly tinted glass. Just smile and wave boys, smile and wave, because Chet is here to stay. Light fun. If you are a dog lover with a tolerance for whimsy and in the mood for some mystery, Dog On It should fit the bill. 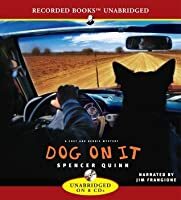 Definitely a clever concept tailored for canine fans, Quinn mostly succeeds by staying faithful to the concept of dog as narrator. Chet is waiting for his owner and partner Bernie to come home. When Bernie arrives, he smells a little boozy and Chet’s “back teeth were floating,” but needless to say, Chet’s a forgiving sort. It isn’t long before a woman drops by, begging Be Light fun. If you are a dog lover with a tolerance for whimsy and in the mood for some mystery, Dog On It should fit the bill. Definitely a clever concept tailored for canine fans, Quinn mostly succeeds by staying faithful to the concept of dog as narrator. Chet is waiting for his owner and partner Bernie to come home. When Bernie arrives, he smells a little boozy and Chet’s “back teeth were floating,” but needless to say, Chet’s a forgiving sort. It isn’t long before a woman drops by, begging Bernie to find her missing fifteen-year old daughter. Bernie reluctantly agrees–the five hundred dollars she waves at him will make a huge difference paying overdue bills. Naturally, Chet accompanies them to the woman’s home–he was trained as a K-9, after all (if only that cat hadn’t crossed his path!). Bernie inspects her room, Chet sniffs out a bag of pot they forget to mention to the mother, and to no one’s surprise, the girl shows up while they are still there. Chet approves; she’s a fan of his mismatched ears and has a gentle pat. Case solved, they return home and to bed. The next morning, they’re awakened early by Bernie’s ex-wife and a female reporter doing a story on Bernie. In a moment of deja vu, they are called again by the teen’s mom–she’s missing again. It is soon clear that this time there’s something wrong. There are types of books I don't like, don't care for, or downright can't stand. Two of them are 'Cozy Mysteries' and 'Run-of-the-mill Thriller'. So, when 'Dog On It' was recommended to me by a friend, I rolled my eyes at the cornball title and politely refused this canine-perspective mystery. She insisted, said it wasn't what I thought it would be, and I gave in. Last week I cracked it open with little enthusiasm, intending it to be more of a personal exercise in speed-reading just so I could t There are types of books I don't like, don't care for, or downright can't stand. Two of them are 'Cozy Mysteries' and 'Run-of-the-mill Thriller'. So, when 'Dog On It' was recommended to me by a friend, I rolled my eyes at the cornball title and politely refused this canine-perspective mystery. She insisted, said it wasn't what I thought it would be, and I gave in. Last week I cracked it open with little enthusiasm, intending it to be more of a personal exercise in speed-reading just so I could tell her I'd read the thing. It turned out to be just what I thought... a cozy(ish)-run-of-the-mill-mystery-with-a-lack-of-thrills. But there was one major difference: Chet the dog. This book won me over pretty quick for all the reasons I didn't expect, and they all had to do with the furry protagonist. Chet's interaction with humans (good and bad), other dogs, and general puppy stuff had me laughing aloud and reading constantly. And it's not all heartwarming stuff either... That scene in the dog pound? That gave me chills! So, in turn, I'm going to recommend you read this book... even though you might think it ain't your cup of tea. I wager you'll like it regardless. What a great read! The mystery is told from the POV of the dog, Chet. If Chet doesn't see/hear/smell it neither do we. And Chet gets distracted easily. Saves us from a lot of unnecessary tedious details. The story is written with great flair, humor and style. I'm really enjoying this book, and will be sure to read the next one when it comes out! Those of us who read a lot often have a tendency to fall into particular grooves when we choose our reading material. If we're into crime, we inclined to read successive crime novels, similarly, for me the historical fiction genre, my favourite. Sometimes it is both enjoyable and therapeutic to branch out and explore other genres. After a number of very solid, earnest reads in recent weeks, I opted to grab from my library a humorous book. What a good idea that was! I must preface my review here by Those of us who read a lot often have a tendency to fall into particular grooves when we choose our reading material. If we're into crime, we inclined to read successive crime novels, similarly, for me the historical fiction genre, my favourite. I must preface my review here by saying I am a passionate dog owner with a great love of all things canine. So when I chose Dog On It I had in mind some interest in how the author would handle the narrative. Because what is key to an appreciation of this light-hearted cozy mystery is that the narrator is Chet The Dog (note: upper case is deliberate!). Bernie Little is self-employed, running a small detective agency. He lives with his mixed breed, large dog Chet in a suburb of Phoenix, where he suffers from a lack of paying work. He is experiencing financial difficulties, including failure to pay his son’s school fees, which provokes the wrath of his spitfire ex-wife Leda. Just as things are getting very desperate, he is engaged by Cynthia Chambliss to find her missing daughter Madison, teenage school girl. Cynthia’s ex husband Damon Keefer is involved in the development of a gated community outside Phoenix, which appears to be in financial trouble. A freak situation finds Chet transported to an old industrial site adjacent to a disused mine in the desert across the border in New Mexico. He is imprisoned without water in the mine, until he is able to escape. He makes a long trek across the desert and has lots of adventures along the way back to his home and his beloved master Bernie. For quite some time Bernie has held suspicions about dodgy finance deals and suspects they are connected in some way to the Madison Chambliss disappearance. Although his methods seem haphazard, Bernie knows what he is doing and ultimately resolves the mystery. Along the way he forms an alliance with local news journalist, Suzie Sanchez. Chet is greatly pleased about this, as Suzie develops a great affection for him, and is a reliable source of doggie treats. The key element of the success of this novel is that the story is told through Chet’s eyes. A canine narrator is not new, but the skill of the author in intuiting Chet’s mental processes with pin-point accuracy elevates this doggie novel above many others I have read. As a passionate dog owner, I have good insights into canine behaviour. All the way through the book I could see elements of my own dogs' personalities and habits in Chet's conduct and ideas. These include being obsessed with food, constantly scenting the surroundings, barking just because... Clearly Spencer Quinn has close bonds with his own dog, as he absolutely nails the dog's characteristics and thought processes. The story is told with great humour, and Chet’s doggie observations of the human world he inhabits are often quite insightful. He has a great sense of irony for a dog. The humour lifts the story from something plain, verging on the banal, to something engaging. It’s not high drama, but a very satisfying cozy mystery. And I laughed on nearly every page. Comic relief is always welcome in our serious lives, and I think the adventures of Bernie and Chet The Dog make for a relaxing, funny, entertaining novel. It would be perfect holiday reading. I read Dog On It because a friend recommended it, saying it made her laugh. I like dogs and I like laughs. Plus, after just coming off of reading The Art of Racing in the Rain, a truly great book narrated by a dog, I thought this was a perfect time to do so. I had no other expectations going into Dog On It, except knowing that it was the first in a “Chet and Bernie Mystery” series (one of them has got to be the dog right? ), and there is also a praise on the cover by Stephen King. What more could I read Dog On It because a friend recommended it, saying it made her laugh. I like dogs and I like laughs. Plus, after just coming off of reading The Art of Racing in the Rain, a truly great book narrated by a dog, I thought this was a perfect time to do so. I had no other expectations going into Dog On It, except knowing that it was the first in a “Chet and Bernie Mystery” series (one of them has got to be the dog right? ), and there is also a praise on the cover by Stephen King. What more could I ask? Here’s the lowdown: Chet is the dog (I solved that mystery in the first page). He is an almost-passed-the-K9-training-test, large mixed-breed dog with mismatched ears, and an off-the-chart dog intelligence topped off with a sense of humor. How can a dog have a sense of humor, you ask? He narrates the story from a dog’s POV. Bernie is a one-time cop, now private detective who is slightly down on his luck. When he paid a visit by a mother looking for her missing teenage daughter, the mystery is on. Quinn is a pretty much a genius portraying comedy by using the dog’s point-of-view. The one-liners and viewpoints consistently made me laugh. I expected the humor to go stale at some point, but if anything it just gets better. I say Quinn is a comic egghead, who has created a perfect character in Chet. It’s also a plus to know that the human story never gets lost in the dog’s view of things. It’s enhanced because as the reader we follow both sides simultaneously, and receive the benefit of laughs as only a dog would see things (a dog, and Mr Quinn of course). "I sniffed the air in hopes of scraps: poolsides were usually good for a potato chip or two, or even one of those mini hot dogs – had to be careful about the toothpicks they came on, I’d learned that the hard way." That’s plucked that from the middle of the book, but I hope you see a hint of Chet’s personality. Like I said, Dog On It is only the first of the series, currently up to #8. If you like fun reads set in the middle of a mystery, I suggest these for sure. One other tidbit: Spencer Quinn is a pseudonym used by a very well known thriller author. This is a comic mystery told adorably from the point of view of Chet the dog. Being a dog and all, Chet has a different way of looking at things and tells the story with lots of pauses for “ahhh’s” (hooray, head scratch), and “thump thumps” (uncontrollable tail wag). He gets distracted easily by tantalizing smells. It’s super cutesy, I admit, but I love it still. Sometimes a person needs a little cutesy to balance out the ugly, mean-nasties. Chet’s owner Bernie is a gruff, divorced private investigator but Chet loves him all the same. Seen through Chet’s eyes, many, if not most, of Bernie’s actions are unintentionally humorous as Chet is often confounded by Bernie’s behavior. However, as the book goes along Chet and Bernie (but mostly Chet) are put into some life-threatening situations. If you don’t like doggies in peril you may have a hard time with this one. Parts of it were definitely hard to read. Poor Chet is stabbed, tossed by a car, almost made into a dog fighter, starved and nearly euthanized. You’ve been warned. The case revolves around a missing teen and was unexceptional and not all that gripping but then again I’m use to gory serial killer mysteries when I bother to read them. This type of quieter mystery needs me some gimmicks or humor or I’ll lose interest fast. This one has both but it was the characters that made the book work for me. Sure, Chet’s thoughts are too people-like but if you go with it you’ll have fun. He even makes rather sad sack Bernie lovable. You rarely forget the narrator is a dog and I loved that. Even when Chet is “on the job” he’ll take the time to snarf up the Cheerios at the client’s house. How can you not love Chet? ★★★★☆ (This is a review of the audiobook.) I’ve heard Jim Frangione narrate other audiobooks, so I had to concentrate at first to remember this delightful mystery is told from a dog’s POV. Mr. Fragione does a nice job of it here. I kind of like him with a bit of ‘tongue-in-cheek,’ mixed with the ‘eagerness-to-please,’ and ‘why are these humans behaving this crazy?’ qualities in his canine narrator delivery. Oh! The things that happen to this dog! Stun-guns, bullets, knives, kidnappers, mountain lions, the pound, electric fences, biker bar-fights, and more! Chet is a wonderful pooch who enjoys riding shotgun with his human companion, Bernie, a delicious private investigator. So, you can imagine the scrapes and misadventures. My heart was in my throat a few times and I laughed out loud more than once. Chet is clever and insightful, but not overly smart, and all loveable. I’ll definitely continue the Chet and Bernie Mystery series. Can't wait to get to the one with the missing elephant named ‘Peanut’! February might be a short and bleak month, but this year we have the debut of a new, unstoppable, hilarious, hard hitting crime fighting duo--Bernie and Chet--to look forward to. Bernie is a human private investigator with more heart than money. Chet is an almost completely trained police dog (there was an incident with a squirrel during the final field test--he'll tell you about it if he gets time later). And that's the real kicker to this team--Chet narrates the action in a very "dog nation" k February might be a short and bleak month, but this year we have the debut of a new, unstoppable, hilarious, hard hitting crime fighting duo--Bernie and Chet--to look forward to. Bernie is a human private investigator with more heart than money. Chet is an almost completely trained police dog (there was an incident with a squirrel during the final field test--he'll tell you about it if he gets time later). And that's the real kicker to this team--Chet narrates the action in a very "dog nation" kind of way. Their current case is a missing 17 year old girl that many people don't want to be found. It's a good mystery with interesting clues, and the charm of the storytelling style just can't be beat. The great news is that this is the first book in what promises to be a popular ongoing series--author Spencer Quinn and his dog Audrey are busy on the next one even now! If I am translating Chet’s tail wagging properly, I believe he wants me to thank you for the kind words you’ve shared with us about Dog On It. He’d also like me to invite you read his thoughts on his new blog. Visit www.ChetTheDog.com for a daily look into the mind of our favorite four-legged detective sidekick. Plus, if you’re on Facebook, please join me in the group named Chet Appreciation Society where you’ll find al the latest Chet news and information plus you’ll be able to meet and chat with other Chet fans and author Spencer Quinn. The more, the merrier so tell your friends to tell their friends to join. But wait, there’s more! Chet the Dog also Twitters! Follow him at www.twitter.com/ChetTheDog so you too can know whenever he smells bacon! I enjoyed this story. I appreciated the way the story was told from the perspective of a dog (albeit a very smart one). Aside from the unique narrator, this is a run of the mill mystery book. So run of the mill, in fact, that I was four chapters into the audiobook version before I remembered that I'd read this book before (in a regular book version). That such a uniquely told story still managed to become unforgettable within a few years is telling. As well, the Audible version of this book was horribly edited. There were long (several seconds each -- and I listen at an increased speed) pauses of dead air. Sometimes this was between chapters, but often it was not. And speaking of chapters, this was one of those annoying books that did not align its chapters with the chapters audible sets. I loved the narration by Jim Frangione -- he did a great job of somehow managing to sound exactly the way a dog should. I listened to the audio book, and given the fact I literally had to stop the car on I-17 I was laughing so hard, I would definitely recommend the audio. Dog on It is from Chet the dog's perspective, and he is a charmer. Chet isn't a very good dog, but he's a great dog especially for the almost down and out Bernie owner of The Little Detective Agency. As far as Chet is concerned Bernie can do no wrong, and that's what makes this such a charmer. Spencer Quinn jumps into the heart and mind of a dog. I listened to the audio book, and given the fact I literally had to stop the car on I-17 I was laughing so hard, I would definitely recommend the audio. Dog on It is from Chet the dog's perspective, and he is a charmer. Chet isn't a very good dog, but he's a great dog especially for the almost down and out Bernie owner of The Little Detective Agency. As far as Chet is concerned Bernie can do no wrong, and that's what makes this such a charmer. Spencer Quinn jumps into the heart and mind of a dog. Or, at least what we humans would like to think is the heart and mind of our pets. It's been a few years since I listened to this so the mystery is murky in memory, but frankly the mystery is not why this book is a success. Chet's POV is hysterical whether he is engaged in a bark fest with Iggy his next door dog best friend or admiring the way Bernie moves through life or contemplating the horror of falling down on the job when he smells cat too near his door. I don't normally do dog books as I don't do bittersweet or coming of age crap, but the Chet and Bernie show is an easy fix to that problem. I completely adored this book. It's a mystery, but the driving force behind the novel is the narrator, Chet the dog. He gives a voice to all your dogs thoughts, and Quinn is consistent in Chet's characteristics throughout. Chet will be recalling plot, and get distracted by a rabbit, or bark his head off at the neighbor's dog, without realizing he is the source of commotion until owner Bernie tells him to knock it off. I think this book is wonderful first of all for anyone who has ever owned a dog I completely adored this book. It's a mystery, but the driving force behind the novel is the narrator, Chet the dog. He gives a voice to all your dogs thoughts, and Quinn is consistent in Chet's characteristics throughout. Chet will be recalling plot, and get distracted by a rabbit, or bark his head off at the neighbor's dog, without realizing he is the source of commotion until owner Bernie tells him to knock it off. This was a fun book, 3.5 stars with an extra half because it is the beginning of a series. Chet is a dog that almost graduated from the Police Academy & would have if not for a cat. Bernie is an ex-soldier & ex-cop who is now a private investigator with a big heart. The story is told from Chet's POV, which makes it pretty funny, somewhat corny, but definitely a fun read. The writing is well done. The case is interesting, especially as we only see those portions that Chet is interested in This was a fun book, 3.5 stars with an extra half because it is the beginning of a series. Chet is a dog that almost graduated from the Police Academy & would have if not for a cat. Bernie is an ex-soldier & ex-cop who is now a private investigator with a big heart. The story is told from Chet's POV, which makes it pretty funny, somewhat corny, but definitely a fun read. The writing is well done. The case is interesting, especially as we only see those portions that Chet is interested in - somewhat more than a real dog would be, but with plenty of doggy distractions such as food, playing ball, going for walks & his opinion of other pets. It's well plotted & well executed. We learn a lot about Bernie, Chet & several other characters slowly, logically & often between the lines. The story slowly comes together with some good action & thrills. This was my very first audiobook, believe it or not, and I really enjoyed how the story was told from the dog's hilarioius point of veiw. I'm going to have to practice with audiobooks, though because I have a tendancy to get distracted and found myself going back to listen to parts I missed. Thanks for the recommendation Carol!! Bernie Little, graduate of West Point and former cop, runs the 'Little Detective Agency,' which consists of Bernie and his dog Chet. The agency is located somewhere in the New Mexico/Nevada area. The book is narrated by Chet from his doggy point of view, which makes it fun since he doesn't quite get idioms, is confused by conversations, sees the world through his schnoz, and is always on the lookout for a tasty snack. Chet has heard Bernie talking about the agency's 'cash flow problem' and thinks Bernie needs to take a job soon. So it's all good when Bernie is hired by an attractive divorcée, Cynthia Chambliss, who's worried because her teen daughter Madison didn't come home from school. Madison soon reappears with a bogus story about where she was, but Bernie figures all is well and goes about his business. Before long Madison disappears again, and this time she doesn't return. So Bernie and Chet get back on the case. Madison's father, Damon Keefer, is a big-time real estate tycoon in the midst of constructing a high-end housing development. He seems a little blasé about Madison, suggesting she ran off to Las Vegas to let off some steam and will soon return. He also seems to want Bernie off the case - and he's not the only one. As soon as Bernie signs on to look for Madison a strange car starts lurking around his neighborhood and odd things start to happen. The worst thing is Chet's dognapping. When the pooch sneaks out to visit a girl dog with a seductive bark he's snatched up, thrown into the skulking car's trunk, and driven very far away. Chet soon falls into the hands of a Russian mobster who calls him 'Stalin' and plans to enter him into Mexican dog fights. Before Chet makes his escape he glimpes Madison in a window...but unfortunately Chet can't communicate this to Bernie when he gets home after additional harrowing adventures. In the course of their inquiries Bernie and Chet talk to Madison's family and friends, visit Keefer's pricey housing project, come across Russian mobsters, find themselves in dangerous situations, and so on. As it happens Bernie also becomes interested in a pretty journalist named Suzie, though Chet isn't exactly sure what's going on between them. Suzie has tasty dog biscuits in her car, though, so it's all good...ha ha ha. The story's plot is pretty straightforward and the culprits - and their motivation - are not too hard to work out. The pleasure of the book lies more in the entertaining characters and the mountainous setting of the story. I especially liked Chet and his quirky brand of narration. Told entirely from the point of view of Chet (aka Chet the Jet) a dog who almost passed the police K-9 training course, this is one book that will have you wondering about every single move your dog makes. Chet belongs to Bernie Little of the Little Detective Agency (ahem, an unfortunate name, right?) and his job is to help Bernie crack their cases. This time there is a 15 year old girl who might have run away, might have been kidnapped and it's a super sized problem for our detective team to so Told entirely from the point of view of Chet (aka Chet the Jet) a dog who almost passed the police K-9 training course, this is one book that will have you wondering about every single move your dog makes. Chet belongs to Bernie Little of the Little Detective Agency (ahem, an unfortunate name, right?) and his job is to help Bernie crack their cases. This time there is a 15 year old girl who might have run away, might have been kidnapped and it's a super sized problem for our detective team to solve. Bernie and Chet (the dog) are working on a missing persons case. Told from Chet's point of view, which is...truthfull, humorous and just matter-of-fact. I love getting into the dog's brain. This is a very smart dog, who is 1/2 of the the Little Private Investigations firm. A wonderful, quick read for anyone who loves dogs, detectives and a little suspense. I had a hard time putting it down. I'm not exactly a dog lover but that didn't keep me from enjoying Dog On It! : A Chet and Bernie Mystery by Spencer Quinn. I had read several favorable reviews that called this debut novel light hearted, creative, hilarious, and promised something different. It seemed like the perfect laid back read for the holidays. Dog On It! delivered. Not just a mystery, but an insightful look into a special relationship as Chet, our canine narrator and his human assistant, Bernie, sink their teeth into solvi I'm not exactly a dog lover but that didn't keep me from enjoying Dog On It! : A Chet and Bernie Mystery by Spencer Quinn. I had read several favorable reviews that called this debut novel light hearted, creative, hilarious, and promised something different. It seemed like the perfect laid back read for the holidays. Dog On It! delivered. Not just a mystery, but an insightful look into a special relationship as Chet, our canine narrator and his human assistant, Bernie, sink their teeth into solving the case of a missing teen. Chet is a skilled four legged storyteller as any human could be. He's curious, loyal, funny and ferocious when needed and loves to eat, and not just the usual dog food. Chet frequently woofs about his people, his kind, and his tribe. By the end of the book I wanted to join his tribe too. 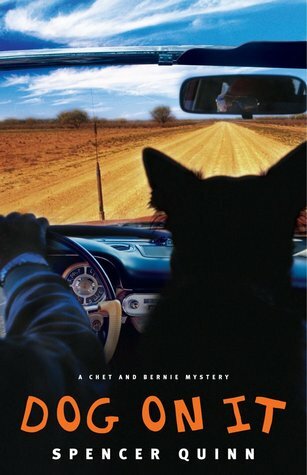 The second Chet and Bernie mystery, Thereby Hangs a Tail: A Chet and Bernie Mystery, has just been released and is available at our library. Treat yourself to either. They're delightful! This book is just pure fun. The mystery is very well done, with the clues adding up and what Chet knows, but can't actually tell anyone because he's a dog, perfectly put together. I love the "voice" of Chet. This reads like exactly what a detective dog might be thinking, with an emphasis on the dog parts. He will start to ponder a situation and get distracted because he finds a dusty Cheeto under the bed. Or how he barks which causes his friend, who lives next door, to yip and they go back and fo This book is just pure fun. The mystery is very well done, with the clues adding up and what Chet knows, but can't actually tell anyone because he's a dog, perfectly put together. I love the "voice" of Chet. This reads like exactly what a detective dog might be thinking, with an emphasis on the dog parts. He will start to ponder a situation and get distracted because he finds a dusty Cheeto under the bed. Or how he barks which causes his friend, who lives next door, to yip and they go back and forth, getting into a rhythm which Chet thinks if great, but Bernie, his human detective partner, does not. And Chet really dislikes cats. This made me laugh out loud many times. The is the first book in the Chet and Bernie Series. I enjoyed reading the story from Chet point of view. This we find Bernie taking a case of a missing teenager. Chet version of the action is fun. I like the fact of people actions regarding animal abuse was highlighted in this story. No I don't condone it but it exists. I plan on reading the others in the series. It isn't uncommon in the annals of crime fiction to find that two sleuths are better than one. Can you imagine Holmes without Watkins, Lydia without Bill, Rebus without Siobhan? DOG ON IT introduces yet another inspired pairing, private investigator Bernie Little and his best friend, Chet. The only unusual aspect of this is that Chet is a canine K-9 school drop-out. Bernie couldn't ask for a better partner; Chet works for food and has a knack for finding missing people. That skill comes in handy It isn't uncommon in the annals of crime fiction to find that two sleuths are better than one. Can you imagine Holmes without Watkins, Lydia without Bill, Rebus without Siobhan? DOG ON IT introduces yet another inspired pairing, private investigator Bernie Little and his best friend, Chet. The only unusual aspect of this is that Chet is a canine K-9 school drop-out. Bernie couldn't ask for a better partner; Chet works for food and has a knack for finding missing people. That skill comes in handy when they are hired by Cynthia Chambliss to find her missing 15-year-old daughter, Madison. Chet and Bernie haven't spent much time on the case when Madison returns home. Chalk it up to a dog's intuition, but Chet is not buying her story about her disappearance. Less than a week later, Madison disappears again; and Chet and Bernie go into a full-bore investigation which leads them to exciting adventures involving Russian mobsters, car chases and biker bars. In a stroke of genius, Quinn decided to leave the narration up to Chet. It's very amusing to have the story told from the point of view of the dog. Since he is a dog, he can't always make sense of what anyone is saying or doing. He also misses out on pieces of the action for doggy reasons, such as needing a nap or being stirred by the howls of a she-dog. Quinn does a great job of maintaining the dog's point of view throughout the book. If you, like me, are a reader who does not care for animals that don't act like animals, rest assured that Chet is thoroughly a member of the canine species throughout. He doesn't talk; he doesn't interpret; he follows his nose and lives to please his master. Some of his observations about human behavior are downright hilarious. There are also some touching moments, as when Chet ends up in an animal shelter and learns more than he wants to about euthanasia. My only issue with the book had to do with the resolution. I didn't quite buy that Chet would be able to retrieve the trail of a previous journey, and several aspects of the conclusions were way too convenient. Overall, the plot was a bit lightweight; but that was more than made up for by the wonderful characterization, especially of Chet. I approached DOG ON IT with skepticism, as I prefer my reading to be realistic and on the darker side. I was rather amazed to find how much I enjoyed it! Liking this book has severely damaged my street cred as a Badass reader. Truthfully, I can't imagine that even the most dark-hearted reader wouldn't find DOG ON IT to be amusing. It's a unique and ingenious book. I can't wait for the next Chet and Bernie adventure. I really liked this book. It's told from the perspective of a dog, Chet, owned by Bernie, a former cop and army vet who runs a not-too-prosperous private investigation agency. The book is a mystery, an interesting one but not overly suspenseful. That worked for me, too, as thrillers are too intense for me. I think this book would be very enjoyable even for mystery fans who aren't usually a big dog story fans. The style is easygoing but the pace is consistent; I didn't want to put the book down a I really liked this book. It's told from the perspective of a dog, Chet, owned by Bernie, a former cop and army vet who runs a not-too-prosperous private investigation agency. The book is a mystery, an interesting one but not overly suspenseful. That worked for me, too, as thrillers are too intense for me. I think this book would be very enjoyable even for mystery fans who aren't usually a big dog story fans. The style is easygoing but the pace is consistent; I didn't want to put the book down and finished it in 2 sessions. I was intrigued by the mystery of the missing girl. I was also interested to see how the human and dog perspectives would flow together to unfold the mystery, since Chet experiences things in the early to middle parts of the story that Bernie only figures out later on. Of course, those who know me know that I loved the dog stuff. I have 2 canine beasties living with me (adopt a greyhound, guys, they make greyt friends), and I always wonder what they are thinking and how they perceive the world. I tell myself stories about why they react in certain ways or what they think about any given situation. This book reflects the same sort of thinking. Chet's narration is often more complex than I imagine any dog's thinking to be (he understands that Bernie worries about finances and thinks Bernie shouldn't replace his old Porche when it gets destroyed because of their cash-flow problems), but this is necessitated my having him as the narrator for the story. I found myself laughing every few minutes throughout the book from one of Chet's perceptions or priorities. He's all about food, scratches, smells and sounds, just like I'm sure my guys are. It did make me very anxious when Chet was in danger and got hurt a few times. It bothers me any time a kid or an animal gets hurt in a book or movie, and this being from Chet's perspective made it more upsetting on a certain level. But he is the star of the book and danger is part of the mystery, so it was OK, just a bit tense for me. I’m now looking forward to the forthcoming books in the series; this is the first book in a new mystery series. This is a fun, creative, and unique book that’s told from the point of view of a dog. I don’t think the author captured 100% perfectly the way a dog is but overall he seemed to do an excellent job. I love Chet, Bernie, and Suzie. There’s a lot about Bernie I’d think I wouldn’t like, but there’s so much that’s laudable and loveable about him too. I hope that Charlie plays a bigger role in I’m now looking forward to the forthcoming books in the series; this is the first book in a new mystery series. I love Chet, Bernie, and Suzie. There’s a lot about Bernie I’d think I wouldn’t like, but there’s so much that’s laudable and loveable about him too. I hope that Charlie plays a bigger role in future books. And the story sure reminded me of how I miss having one of these miraculous food vacuum cleaners (dogs) in my life. But, Grrrr, as Chet would say: Even though I know Bernie and Chet have to survive because this is the first book in a series, there are too many times I was uncomfortable with the suspense when Chet and/or Bernie were in danger. One particular time with Chet was brutally difficult for me. I do think the book would have been better if the heroes hadn’t been in danger quite so many times throughout the book; it was all a bit too much. Luckily, there were many very amusing parts. For me, the dog’s voice, and the relationships/characters, and also the humor were the best things about this book. One thing I loved is that the author dedicates the book to what looks to be all his previous dogs, and his current dog Audrey. Edit: I've been thinking about this book and considering upping it to 5 stars until we hopefully get a half stars option, and just remembered a plot point was left wide open, I assume for the second book. Another dog in danger situation. Ack! Chet, just Chet, and his pal Bernie are private detectives. Chet, a K9 police school flunkie and Bernie, a divorced, middle-aged ex-cop are currently having a cash flow problem, whatever that means (Chet has no idea). Chet is happy to share his life his with buddy chasing a ball, sniffing around and hunting the desert creatures near their Arizona home. His favorite thing to do though is hop in the old Porsche and go for a ride. Chet rides along as Bernie trails cheating spouses for a living. Whe Chet, just Chet, and his pal Bernie are private detectives. Chet, a K9 police school flunkie and Bernie, a divorced, middle-aged ex-cop are currently having a cash flow problem, whatever that means (Chet has no idea). Chet is happy to share his life his with buddy chasing a ball, sniffing around and hunting the desert creatures near their Arizona home. His favorite thing to do though is hop in the old Porsche and go for a ride. Chet rides along as Bernie trails cheating spouses for a living. When the well-to-do Cynthia Chambliss comes in search of help locating her missing daughter, Bernie is reluctant to take on the job. It's a job for the police and likely the teenager will come home on her own, after doing something her mother wouldn't approve of. However, because of the aforementioned cash flow problem (what's cash? What's a cash flow problem? wonders Chet), he really has no choice. Chet and Bernie find very little to concern them but when the girl comes home with a fishy story, Bernie is suspicious. Sixteen-year-old Madison's parents insist she's a good kid but when she goes missing again, Bernie has a feeling something is terribly wrong. With Bernie by his side, Chet can find Madison and solve the case but the villains have other ideas. I love the idea of the canine narrator. Chet's voice is wryly funny and sounds authentic. He has canine ADD though and that kind of annoyed me but it makes the story suspenseful. The one thing I didn't like was that Chet couldn't understand his pal Iggy. I figure dogs can understand each other or at least the tone. As for Chet's plot, I found it highly unbelievable. His daring exploits and adventures are closer to Rin-Tin-Tin or Lassie than ordinary dog adventures. I do believe he could use his sense of smell to find his way but the rest was unbelievable. I had to skim some violent scenes. I can't stand animal cruelty. Bernie is not as appealing as Chet. He's overweight, middle-aged, divorced, broke, likes to smoke though he is trying to quit, drinks and uses bad language. He's kind of a loser and I can see why his wife divorced him though she seems like a type-A control freak. He's lucky she lets him see Charlie at all. I did like that he is intelligent and reads a lot. His comments on water and the land got somewhat repetitive. The water issue relates to the story. He should meet my former History of the West professor and chat about that! The one thing I loved about him is his insistence than Chet is his partner and goes where he goes and do NOT refer to him as "the ___ dog"! His name is Chet, thank you very much. That sounds like me! Anyway, his character slightly improves towards the end but he's too old and awkward to be an appealing hero. Yes I know he's very human but he didn't appeal to me. The only other human in the book who is even remotely appealing is Suzie, a reporter and she makes a bad decision that didn't seem in character. Her involvement in the story is a little too deus ex machina to be realistic. Madison's parents are not very nice. Her mother doesn't like dogs and is a little too self-involved with her own drama. Her father is a wheeler and dealer, a businessman at heart and father second. However, by the end, they're both very human characters and I did have some sympathy for them. Madison is mostly a good kid but she does some dumb stuff that could have had serious and dangerous repercussions. She's smart enough to drop a clue to help Bernie find her whereabouts. The villains are downright evil and scary. I skimmed a lot of the story because of the violence (and because it was very late at night). I took exception to the fact that they read like stereotypes though. It felt like they were villains from a past decade. The dialogue didn't need to be spelled out in that stereotypical manner. It was enough to mention their ethnicity and say they spoke in heavily accent English or whatever. I’ll probably never find anyone who dislikes this book. And if they exist, they are monsters. Plain and simple. How could you not love this? Chet and Bernie? Pals forever? Even little Charlie and his “Chet the Jet!” interjections will make you smile. If you love dogs, you’ll be completely taken by the main character who is such a sweetheart he makes you want to reach across the page to pet him. All the other characters were great too, no doubt about it, but it’s Chet who really takes the spotlight. His narration was incredibly strong and realistic, and made the book work. He was adoringly funny and such an interesting and different perspective from what I’m used to. The mystery aspect in this was solid, with some cool twists to really keep us guessing, but if you’re going in with the sole purpose of following the clues along and finding out what happens in the end, you’ll be sorely disappointed. This is one of those books where it’s the journey that counts, not the destination. It’s its characters and the relationships between them that really bring it to life and keep you interested. It’s the fact that you care about the heroes, and want to see them pull through. It’s their endearing personalities and how they deal with the problems in their lives. So even though I enjoyed tagging along for the ride, I wouldn’t have cared less had my travel companions been anything short of awesome. I just finished reading this and it was most amusing and I enjoyed it enough that I requested the next one. It is very rare for me to read the next book in a series. If you love dogs you will probably enjoy it also. Chet is a very entertaining narrator.